This is a guest post by one of my favorite bloggers, Zeba from Hearty Diaries blog. Do check out her blog for lot of makeup and skincare reviews. Today I am going to review Life and Pursuits NURTURE SOFTNESS Certified Organic Ayurveda Child Moisturizing Lotion for you all. I have also reviewed their Child Massage Oil recently, so don’t forget to check it out. This product has been used on my six months old cousin sister who is as adorable as heaven. Moisturising your baby’s skin is a very crucial step because it comes with a lot of benefits. First of all, it helps retain moisture into your baby’s delicate skin and protects it from getting dry, flaky or itchy. Once the moisture gets locked into the skin, it keeps away all sorts of rashes and irritants in addition to maintaining the quality of the skin. 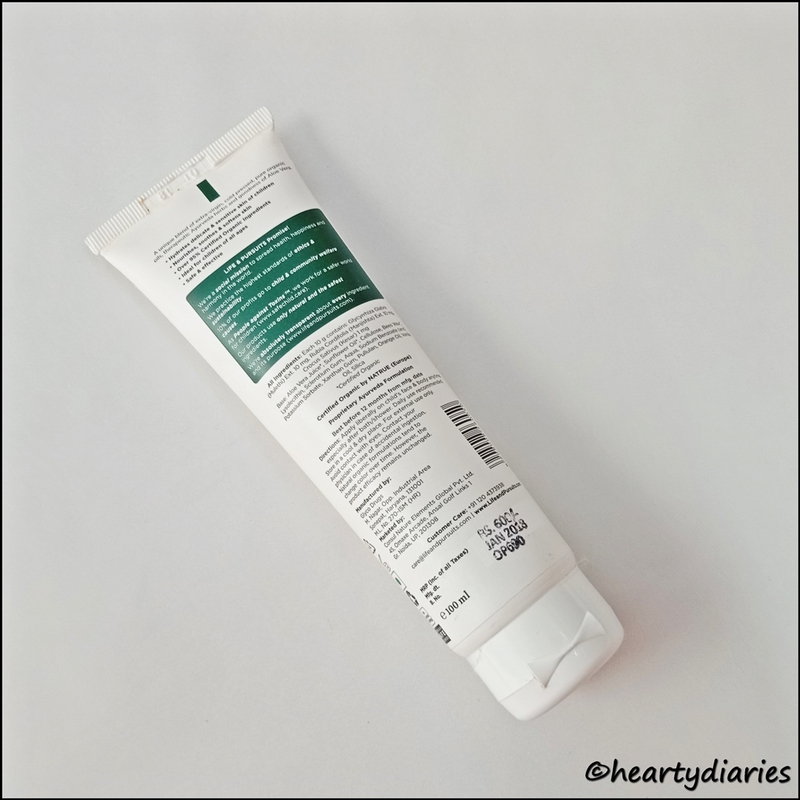 With our Indian market flooded with loads of amazing baby moisturizers and lotions, it is really difficult to select the best one for your toddler and this is when reviews come in handy. While selecting the perfect product for your baby, you must ensure that you are investing in a brand that is committed to producing products that are proven to be safe, mild and effective for your baby and doesn’t compromise with his/her health in any way. 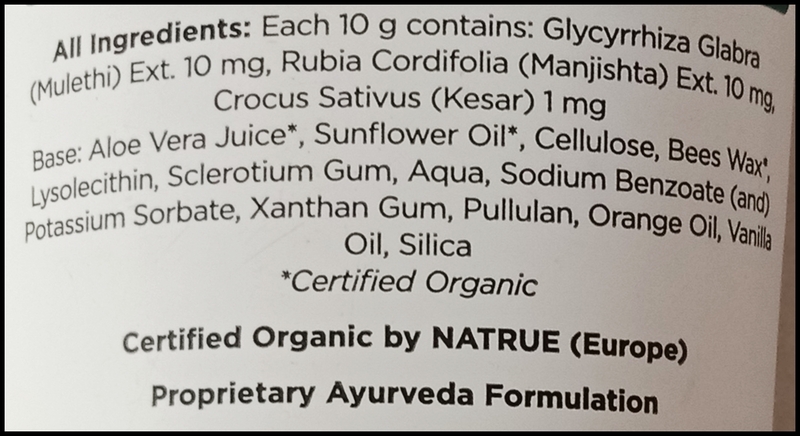 Without further ado, let’s quickly jump into the review..
A unique blend of extra-virgin, cold-pressed, pure organic oils, therapeutic Ayurveda herbs and goodness of Aloe Vera. This lotion comes in a white colored, soft tube with a sturdy flip cap. It has all the necessary product details mentioned on it and looks cute. Overall, the packaging is sturdy, travel friendly but I would’ve appreciated it more if it came with a pump dispenser or something of that sort because it often dispenses way more product than required. This cream colored lotion has a very creamy and smooth texture with a very runny consistency. Moisturisation is very good for the child’s skin but you must also ensure that you are doing it properly, regularly and at a suitable time. The best time to moisturize your baby’s or even your skin is right after bath and this is what my Aunt does to baby Mahira. 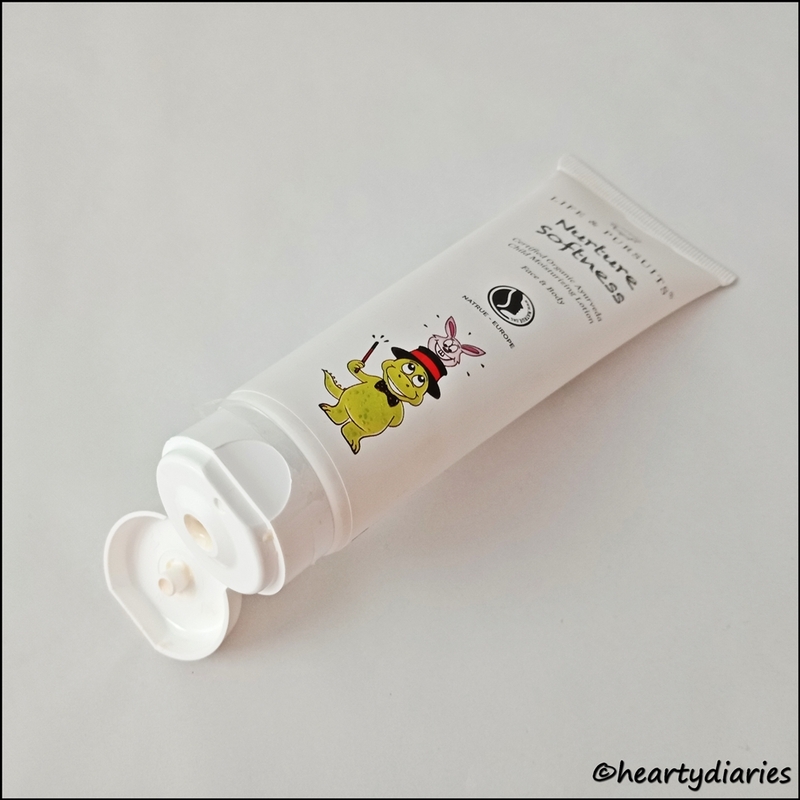 After giving Mahira a good & steamy bath, she squeezes this tube very gently to dispense a pea sized amount of product on her palm and starts moisturizing her face in round, gentle, circular and upwards motions. As for her body, she can still use this lotion but the Child Massage Oil from the same brand works pretty well. On days when the weather is very dry, she moisturizes her body twice and then uses this lotion on her face, hands, legs and literally everywhere. The texture of this lotion is really smooth and gets quickly absorbed into the skin. It does not feel heavy or greasy at all. Its mild smell is also something that we love and doesn’t bother anyone’s nose at all. It makes the skin instantly feel softer, more nourished and more hydrated. Despite having a very light formulation, the moisturisation lasts very long. This lotion also prevents dryness of the skin and treats flakiness or dryness, if any. Overall, it is a great pick for your baby’s delicate skin if you intend to keep it look healthy and nourished. Yes. Not only baby Mahira, even I enjoy the smell and moisturization of this lotion thoroughly. We love everything about it and will definitely make a purchase whenever this tube gets over. Yes. 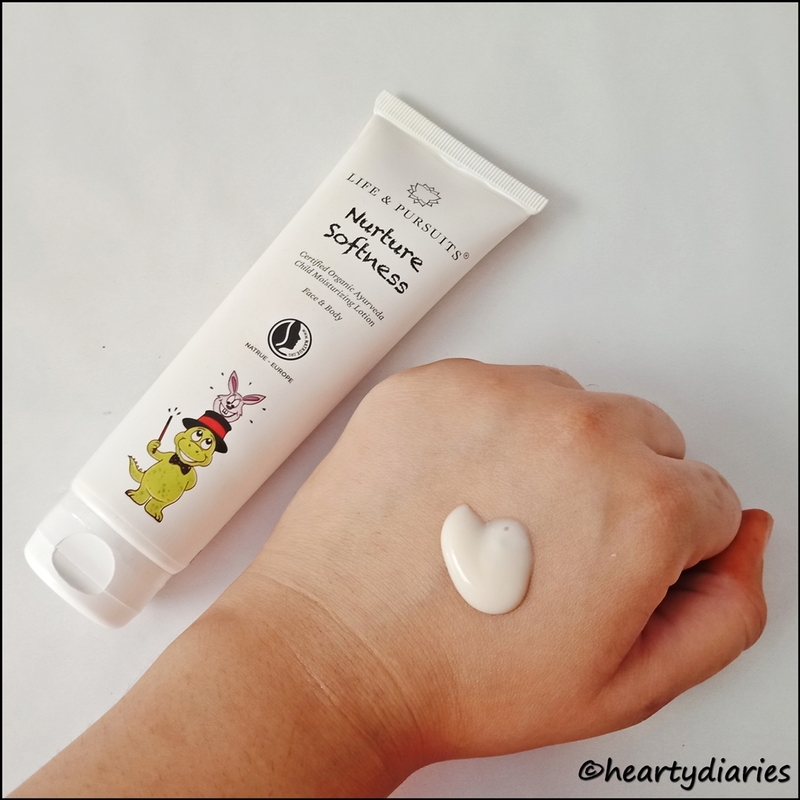 If you are looking for an effective, cruelty free baby lotion, you must grab this one for your child. Yes. This is an effective daily lotion and has a great formulation, so for me, it is completely worth the money.